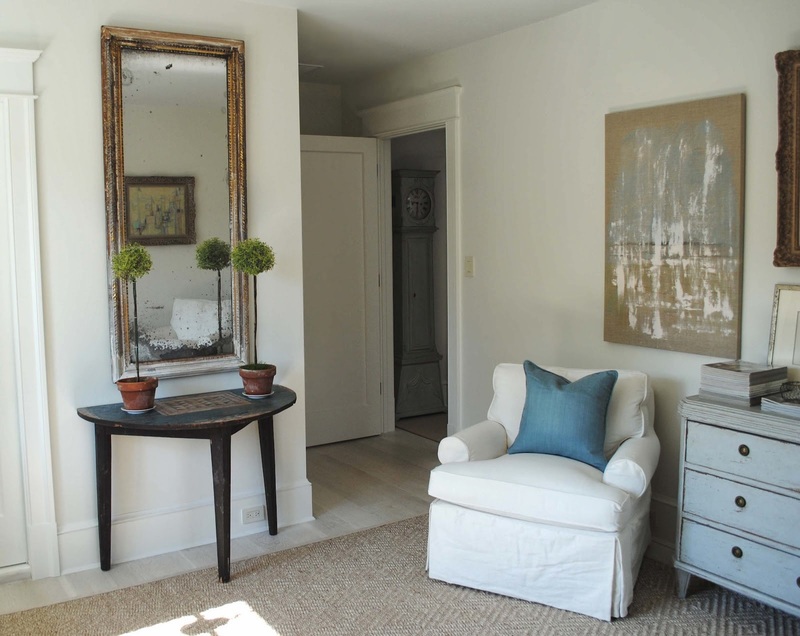 In five days, I've shared my "Five Easy Pieces"--items that enhance any space with minimal effort and even less consideration. They all work, and they just work almost anywhere. My fifth and last item, the demilune table, is as versatile, transitional and functional as any piece of furniture in a home. And you probably won't believe this, but while composing this post, I took a thrifting break yesterday afternoon and discovered a demilune table for my house! Is that fate or what? 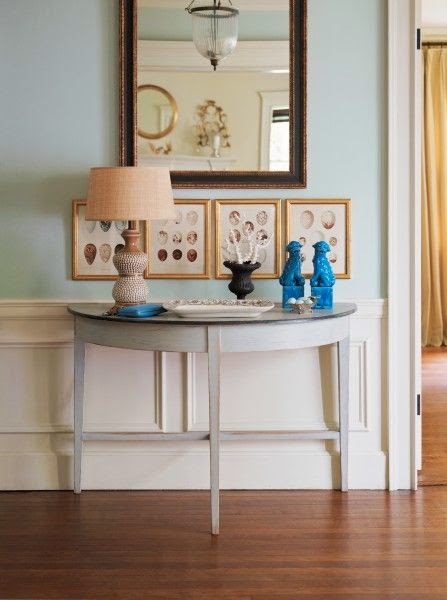 The demilune table (borrowing it's name from the French word for half-moon) is a style of console table that became popular in 18th century France. Their half-round shape is meant to allow the table to fit right up against a wall. Demilune can be simple and free of adornment or they can be intricately carved and gilded. One constant characteristic is that the legs are gently and subtly tapered. A multi-functional piece, the demilune table works in every room in a single house. 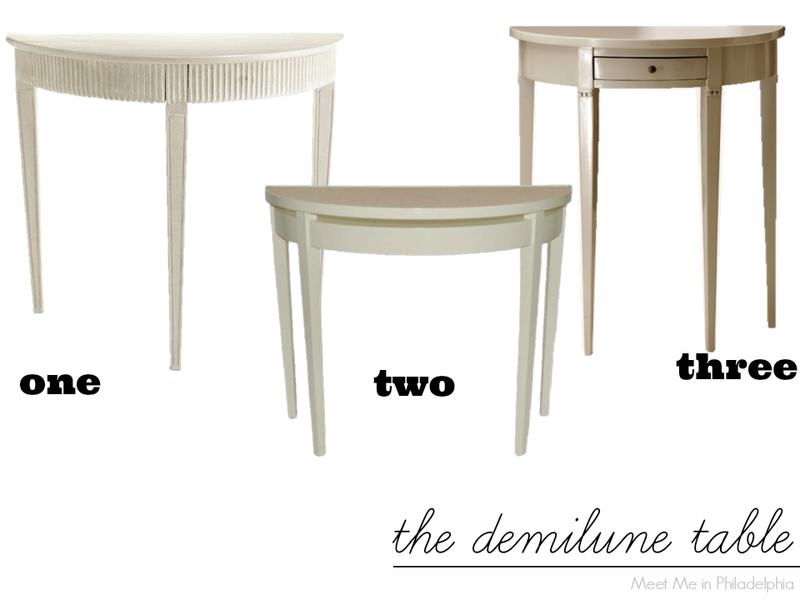 I tracked down a few demilune table options, some of which are on the pricey side. Fortunately, one option with subtly-Swedish lines (from Wisteria) is currently on sale! Curious about the demilune I found for myself yesterday? Look past the tragic brown paint because it has such potential. 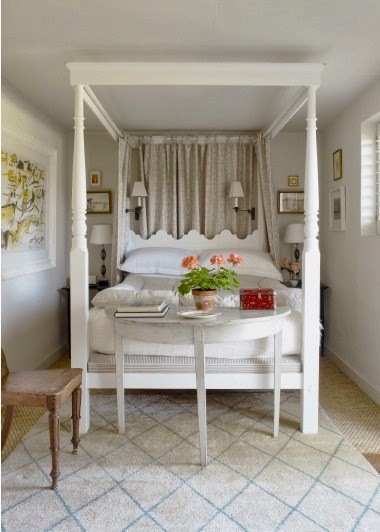 So, there you have it: my "Five Easy Pieces" for effortless decor. I hope you all enjoyed this series. 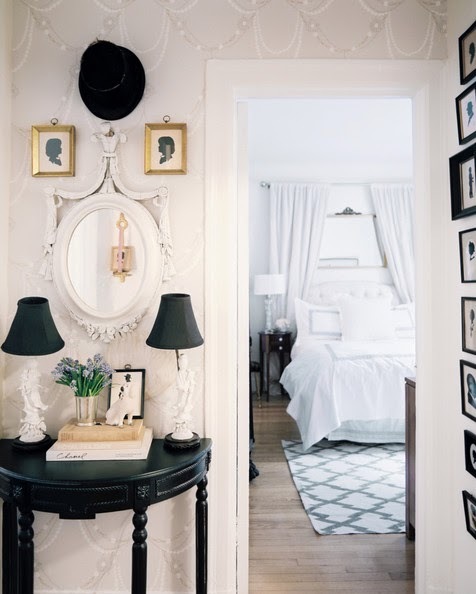 I'm by no means an antique-hunting expert, but I've been focusing on buying classic pieces that will stand the test of time and can function in a few different rooms. I'd still like to hear from you: what are some of your "Easy Pieces"? 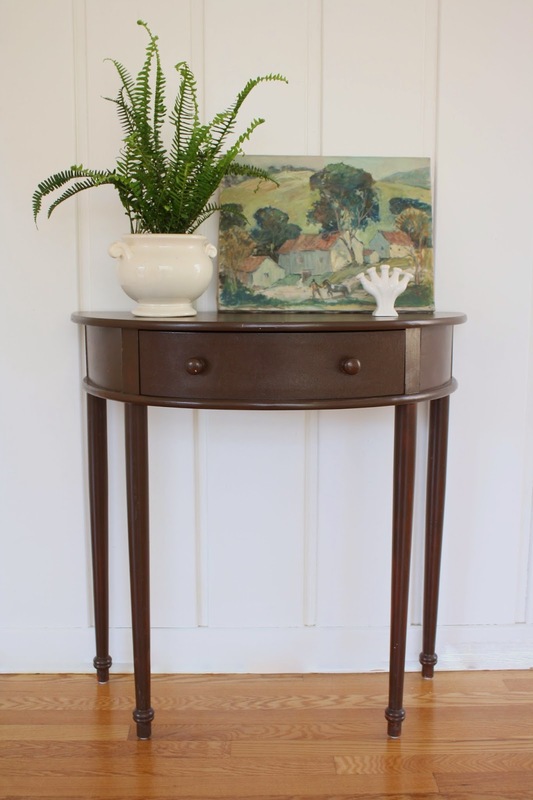 I desperately need a demilune table in our tiny entry! Happy weekend Ashley! This was a great series. 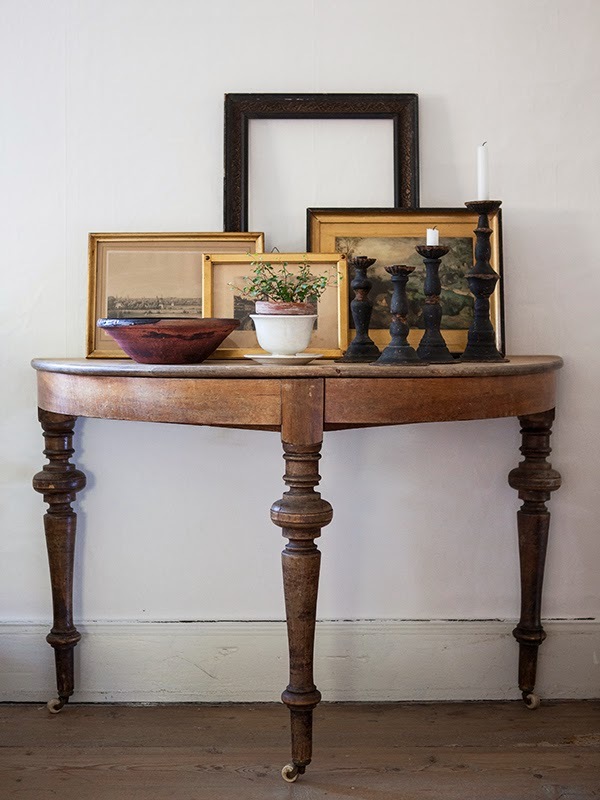 I'm a huge fan of demilune tables, especially the 4 legged ones. I like the balanced look of that. Congrats on your great find! totally loved this series. you picked such great pieces..all five! So true how just a few pieces can really look great anywhere. I would be happy to send you some of my notes! This has been a great series! I'm just finally catching up on my blog reading for the week and I've loved reading thru all of these! Yes! These type of tables are perfect for those "I am not sure what to do with this spot and they take up less room then traditional tables. Perfect for apartments, condos and smaller spaces. Spring Has Sprung in My Etsy Shop! New Vintage & Handmade Items in My Etsy Shop!